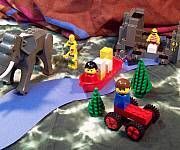 Use construction paper, clay, or other material to create a model that represents the interaction between humans and rivers. Our model shows rivers to be a place for finding food and for growing food and that rivers are an important form of transportation. Rivers have always been important to civilizations.